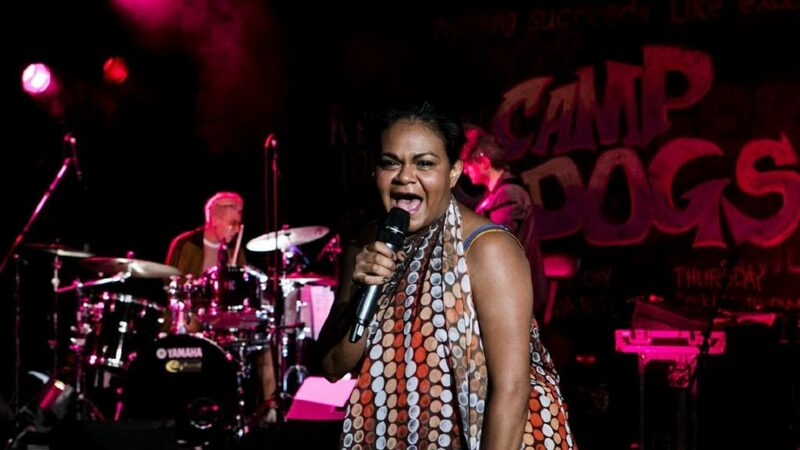 Barbara is a glorious figure — a wild, angry, foul-mouthed, rebellious singer who travels back to Darwin, then Katherine, with her sister Rene and her band, the Camp Dogs. They are visiting the mother who brought them up and who is now dying. The journey teaches Barbara a great deal. Ursula Yovich created the character of Barbara, wrote the book of the musical with Alana Valentine and the songs with Valentine and Adm Ventoura. As Barbara and Rene, Yovich and Elaine Crombie make a great pair: mismatched in personality, continually resisting each other but magnificently united when they sing together. In the story of their journey, Rene tries to keep the errant Barbara on task and Barbara keeps breaking out, outraged by racism, fighting with people and getting drunk with strangers. After some heartbreaking scenes, including a monologue in which she remembers her lost brother, Joseph, she finally learns how easy it is to let her anger go and to reach out. Troy Brady, having played a nerdy roadie, steps out of the shadow towards the end to become Joseph. There is a great deal of tenderness in the narrative and some startling moments of boldness in the songs. The Camp Dogs of the title are the splendid musicians Jessica Dunn, Michelle Vincent and Debbie Yap. They are downtrodden by the remorseless Barbara but always there and full of character. They are placed centre of the Belvoir stage, which is converted, by designer Stephen Curtis, into a pub with lounges and chairs onstage for some of the audience. It represents every pub or small club you’ve ever gone to. There are costumes by Chloe Greaves and lighting by Karen Norris. Director Leticia Caceres has brought it all together superbly. The drama of Barbara and Rene’s journey has a troubled but strong conclusion, including a powerful climactic monologue by Barbara. But the songs carry much of it: St Agnes sung by Barbara alone; Chained to You by Joseph and Barbara; and finally the powerful Let in the Love, sung by Barbara, Joseph and Rene. The songs ultimately tell the emotional story of people torn apart, then finally coming together, with hopes for the future. This is a wonderfully stirring show, funny and moving. It enriches the heart.